It is a legal maxim never to ask in court a question to which you don’t already know the answer. There’s a political equivalent, which is never to ask voters for advice that you don’t intend taking. In advance of next week’s State of the Nation address (Sona), the Presidency invited South Africans to use social media to suggest what President Jacob Zuma should say. The consensus on Twitter and Facebook has been that he should use the opportunity to quit. The corollary is that he should pay back the R246 million public funds spent on upgrades to his private home at Nkandla. Not quite what the Presidency had in mind. Nevertheless, evidence either of the ability of savvy opposition parties to hijack social media platforms or of a simmering gatvol feeling among the citizenry. Perhaps government should take some of the annual R10 million advertising it places in the low-to-no circulation New Age, established by Zuma’s Gupta clan benefactors, and apply it to using social media more cleverly. The buzz around this year’s Sona — Eskom has pledged that bar a national disaster, there will be no load shedding during it — is unusual. Sona, like the annual Queen’s Speech in Britain or the US version whence we have appropriated the acronym, is mostly routine: we’ve done brilliant stuff and we are going to be doing more of it in the year ahead. In other words, it’s political sludge that, despite the presidential vanities involved, tends to deaden rather than enliven the political pulse. So what’s different this time? Maybe the sense that South Africa is in a national crisis. Albeit a crisis that the African National Congress is in denial over, the national mood as reflected in polls, social media, and daily discourse, is sombre. Pressured by growing youth unemployment and social expenditure, a sagging currency and lower world demand for commodities, the Treasury is teetering at the edge of a fiscal cliff. This is made even bleaker by the slow-motion administrative implosion of the one government department that everyone agrees was highly efficient, the SA Revenue Service. With few exceptions, the 22 major state-owned entities are bleeding money with no end in sight, and like most of the 150 smaller ones, are dysfunctional havens of cadre deployment and tenderpreneurial corruption. While this is a legitimate, democratically elected government with substantial popular support, unrest is now endemic in a way that is reminiscent of the apartheid years. Service protests that involve shutting roads, stoning vehicles and burning buildings are a daily occurrence. Xenophobia has in recent weeks again flared up in the kind of looting of township shops owned by immigrants from elsewhere in Africa, which in 2008 cost 62 lives. Meanwhile, the SA Police Service (SAPS) is itself is riddled with corruption and institutionalised aggression. A FutureFact survey last week came up with the startling statistics that in a country where 70% of the respondents are in constant fear of crime, 44% say it would be pointless to report a crime to SAPS, while a third are physically afraid to enter a police station to do so. Such a smorgasbord of problems would be challenging enough for a disciplined, dedicated and highly efficient administration. For one that is high on “good news” rhetoric but low on implementation, the task becomes insurmountable. Politicians and political parties both have an evolutionary instinct for survival. Usually this is a symbiotic relationship: party and leader act in concert to maximise their chances of taking and holding power. On occasion, however, the leader’s hold on power comes at the cost of the broader prospects of the party. Then either the party is bludgeoned into submission by the leader and pays for its subservience down the line with electoral reverses, or else the party ditches its leader. This happened to former British prime minister Margaret Thatcher when in 1990 she was deposed as Conservative Party leader, after it became apparent to her colleagues that the cost of her increasing megalomania was imminent electoral defeat. It also happened to former SA president PW Botha, when an until then supine cabinet took the opportunity of him having a minor stroke, to engineer a palace coup to avert a looming national political disaster. 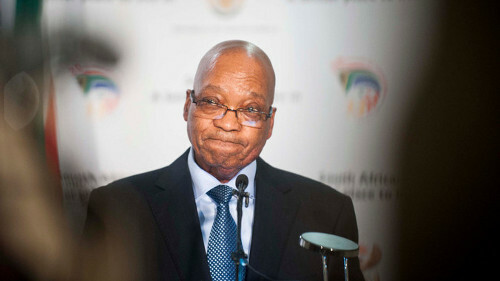 Sona 2015 is possibly Zuma’s last chance — what with local government elections next year — to unite the country, to address corruption and incompetence, and to make economic growth an unambiguous priority. Should he fail to do so and the ANC experiences serious electoral reverses in 2016, it is not the chirping twitterati that Zuma needs to fear, but the knives that will be sharpening in his own kitchen. On the other hand, he could just oblige the chattering classes, take their advice, and announce his resignation during Sona. Hope springs eternal.